The week was another anticipated trip to Mustang Maniac where I was going to finish painting my engine and putting a few bits back on it ready for the car to come back from paint. Somehow I don’t think my painting is up to the standard of the paint job my cars body work is getting. I’m not sure where to start, on the bodywork or the engine? So I think I will start with the bodywork. The car is being primed and block still at the moment and any hidden metal joins are being sealed up and coated to make the whole thing look seamless. An attention to detail many don’t consider. The hood has now been masked up and given the primer treatment now and the parts are coming of and going on the car like you wouldn’t believe. 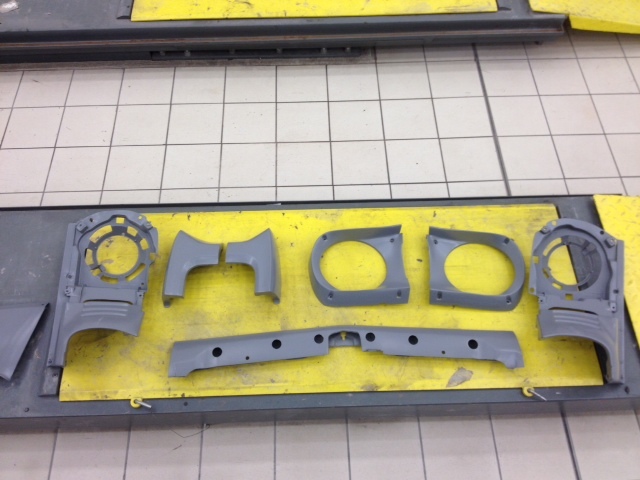 With the car bits removed they are all treated and sprayed in exactly the same levels of details. The parts when cured are then put back on the car for fit and keep them all together ready for more block work. I so want to get down there to see how it’s all done! As I was saying earlier the engine intake manifold was back from shot blasting and John kindly jet washed it all out for me to get rid of the debris left overs, after all the last thing you want in your car’s engine is sand! The intake was allowed to dry thoroughly by the time I got there a few days later. The exposed surfaces were now showing signs of light surface rust again as expected from the exposed metal and elements. The gasket faces needed to be cleaned up again and I lightly polished up the faces ready for the gasket fitting. The gaskets were laid over the intake ports and the intake was carefully lowered onto the gaskets making sure they did not move. The head was lightly bolted down finger tight and then torqued to the thirteen or fifteen pound required to hold it in place. 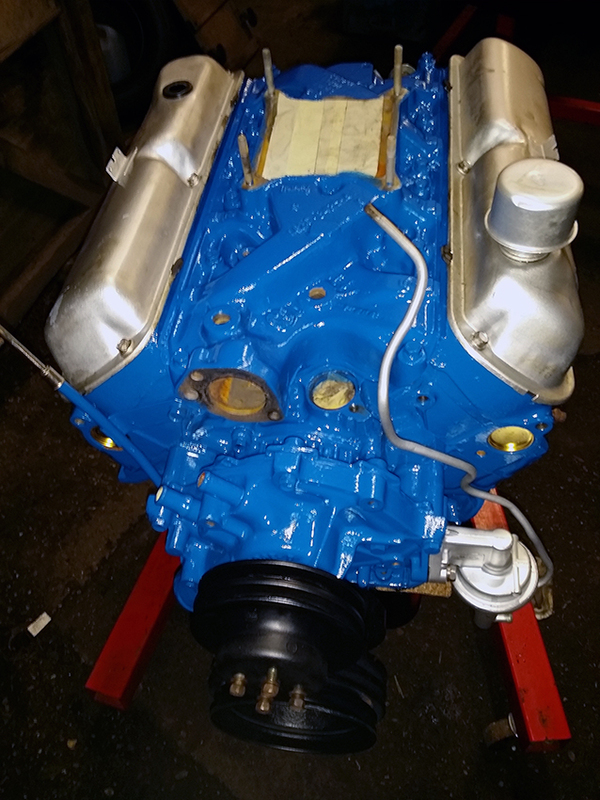 The pot of blue paint used from the engine block was now opened and two coats of engine enamel applied when they were cured. A cover of masking tape was placed over the carb intake holes to stop any undesirable debris getting in the engine. We decided that the best plan here was to know put the old rocker (or valve) covers back on just in case we needed to adjust any of the springs back up again to save damage to new covers and gaskets. I also then mounted the fuel pump back on the side after it had been cleaned up along with the fuel pipe to the carb. With the pump in place there was not a lot more I could do until the paint has fully cured. The story so far for the engine. Next week I may be able to get the senders fitted and the fittings for the pipe works. Then it will start to look a bit more like a working engine rather than the work of art that it is at the moment. You just know full well it’s gonna stay looking like this. I have even bought the soft tooth brushes already to clean it when I get her home! This entry was posted in Car, Photo's and tagged block work, carburettor, engine enamel, ford, intake manifold, Mustang, Mustang Maniac, One man and his Mustang, paint shop, primer, sender units. Bookmark the permalink. Fantastic progress, the shell is looking fab. 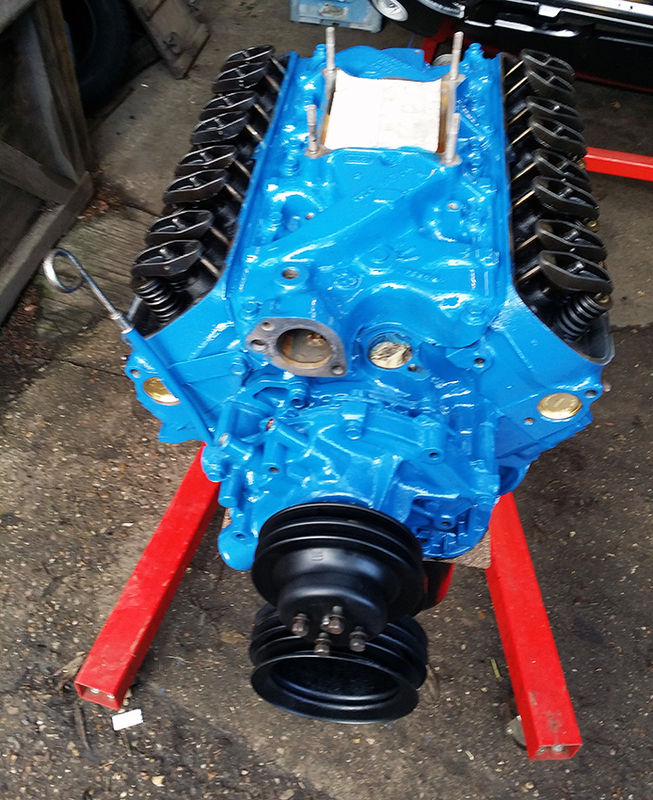 Good work on your engine too, a nice cheery colour. I’m getting excited for you. I’ve been busy with work for the last few weeks and haven’t been keeping upto date on the blog. I just popped in now and wow what a huge amount of progress in a short time.